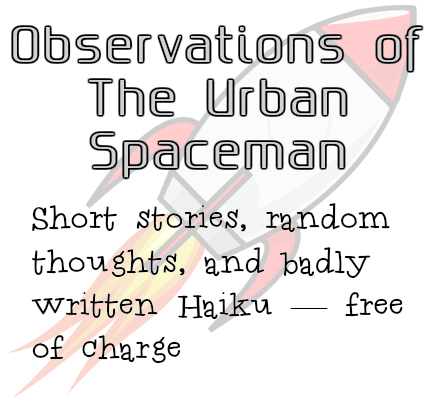 I recently found myself with an hour or two of spare time, and decided to not only partake in Chuck Wendig’s weekly Flash Fiction Challenge, but also to continue my story from last week. In a very “OMG, what did you do to my fairytale/fable?!?! ?” way. In 1991 words, too, which is a whole 9 words less than the word allowance! Back by popular (?) demand, is Detective Roxanne Hood, on the case of the three dead Pigs. Alas, poor coppers, we hardly knew ye. Echoes bounced around the unlit alley; the slurred singing of a group of drunks on the main street was punctuated by the screaming of two fighting tom-cats and the constant hum of the nearby Chinese restaurant’s extractor fan. Every now and again a cacophony of car horns drowned out the other sounds—road rage was symptomatic of the ill mood which had settled over the town. Roxanne pulled the collar of her raincoat up as she stood silently observing from within the deep shadows. Once, a younger, more oblivious Roxanne Hood would have pulled her coat up to keep out the rain. Now, twelve months since she’d crouched over that first dead cop’s body and sworn to herself she’d find the killer no matter what it took, she knew there were worse things than rain to protect your neck from. After an eternity of standing in those shadows, breathing in the dank stench of decomposing food and stale vomit, Roxanne made up her mind. She deactivated the Shadow-ring on her finger and become visible to the human eye once more. Her eyes, violet beneath the hood of her scarlet raincoat, were fixated on the heavy iron door set into the wall of a building which had a definite air of ‘abandoned’ about it. Though she had seen nobody leave and enter by that door in all the time she had been waiting, she knew it was the right place. The Oracle had been very specific about the location… in his own vague, poetic way. Her knuckles wrapped on the door three times, stinging with the pain of the cold and the iron. Nothing. No sliding grille to show beady-looking eyes, no voice calling out ‘password’, not even a whisper of a breath to show that her knock had been heard. The night was not silent, but the building was. Taking a step back, Roxanne laid her right hand palm against the door and closed her eyes. Here, she had to take care. Morganna had taught her many spells, some of them a little too powerful, but the wrong spell here could upset the inhabitants of the building, and severely hamper her chances of success. Although she knew a chant powerful enough to age the iron of the door enough to rust it entirely, she also knew that you didn’t stick an iron door on a building to keep out humans. She opened her eyes and was not disappointed. Olorinen was the one she called upon most for help during her quest; he and Skathara, Goddess of Hunters, walked by her side. Now, Olorinen saw fit to warp the iron, and as Roxanne watched, it began to swirl, as if pulled in all directions at once. A gap opened up, and through this Roxanne stepped through, to be greeted by a large man who smelt of sweat and earth. He stared at her, and she stared back. She couldn’t help it. Though she had, over the course of the past year, heard of many strange things, the Rashka were amongst the strangest of them, and she had never seen one in person before. The creature held out its arm, gesturing for her to venture within. Her dark-vision enhanced eyes were just able to pick out the green moss of the Rashka’s hair, and the craggy limestone of its biceps, before she was forced to walk on. The corridor was dark, and long. Longer than it could possibly have been, to fit within the building she had been observing. Reality-warping magic. Warlock-level stuff. Someone seriously powerful owns this place… or built it. She filed the information away for later consideration. As she walked, she smiled to herself. If only her former colleagues could see her now. If only her former Chief knew what she was up to. Would any of them even recognise her? Her new eyes were only a small part of her new self. The dark tattoos across her forehead and down her cheeks made her look like some devil-worshipping gang member to the norms of society, but half of the inks were protective and the other half power-enhancing symbols. In a way, Detective Hood had died the moment she’d discovered this other world, of magic and monsters, mystery and myth, existing alongside a largely oblivious humanity. At last the corridor terminated in a large room filled with tables and seats, half of them occupied, most of the occupants sub– or supra–human. At a glance, Roxanne thought she saw three vampires, two demons and a half-dozen spirit-possessed bodies. She wasn’t at all surprised that there were no fey present; nothing kept out the mischievous fey-folk like a good iron door. The whole building was probably laced with the stuff. Several of the bar’s inhabitants glanced up at her as she stepped into the room, but most, upon seeing her ink, looked away fast enough. One didn’t, though, a lone man in the corner who let his gaze linger over her, as if hungry for the mere sight of her. Roxanne felt a chill run up her spine at the predatory glance, but she ignored her flight-instinct and instead approached the bar. There, the bartender, a large man with hands that looked too strong too handle fine glassware, looked up at her, and nodded briefly. “What can I getcha?” he drawled. “Surprise me,” she replied, sliding into one of the tatty seats at the bar. She watched as he poured a shot of dark liqueur into a cocktail shaker, followed by a half-glass of ginger beer, a capful of vodka and a scoop full of ice. He spent a good thirty seconds shaking the concoction, before pouring it into a deep, round glass. “Heart Stopper,” he said, before she could ask what he called it. She fished inside her bag for some loose change, but he gave a dismissive wave. Roxanne merely nodded, took a sip of the cocktail—dark and spicy, she thought—and turned to survey the rest of the room. Most of the patrons were sat in groups. Vampires over by the east wall, spirits in the centre, a cadre of ghouls beneath a spluttering torch… but a few of the folks were alone. As well as the leering man over in the corner, there was a woman who did nothing but stare at her drink as it went down on its own, and another man further down the bar who quietly sipped what looked like a plain old beer. He would not have looked out of place at the local yuppie bar, save for the fact that his eyes were black as the night sky, and his suit shifted colours, as if unable to settle on a particular one. Roxanne felt her lip curl; Skin-Dancers were one of the few creatures she had little care for. They forsook their humanity the moment they took their first victim. And all in the name of fashion. “What brings you to Shanith?” the barkeep asked as he poured a round of drinks—something dark and red from the tap, which Roxanne tried not to think about—for the group of vampires by the wall. “I’m looking for a man,” she said, as her violet eyes scanned the crowd once more. She shook her head, swivelling her stool back around. The barkeep pulled another pint of blood as Roxanne leant forward. She briefly ran her eyes over the bartender’s own scar, which ran down the side of his face, as if someone, or something, had raked a talon from his temple to his jaw, and shook her head. The barkeep set a pint of red aside, and leant down on the bar, his arms resting on the hard wood. He nodded, the torchlight bouncing off his dark hair. A moment later, a barmaid fluttered along—literally, on dark stone gargoyle wings—and flew the tray of red over to the vamps. “So. What’d this loner guy do to you?” he asked. She took another sip of the drink. “Sure,” she said with a shrug. Too late, Roxanne realised her mistake. She reached for the bracelet on her arm, the powerful Charm of Olorinen, but the man grabbed her wrist. Feebly she stood, trying to pull her wrist out of his grasp, but already the nightshade was coursing through her veins. Several of the vampires and the hungry-looking man in the corner looked up as she tried to struggle, but none came forward to help. The world spun and started to fade. As Roxanne lost consciousness, she thought she saw the glint of torchlight on the barman’s long canines, but by then it had blended into a dream of happier, simpler times. First of all, that magical twist in the beginning was quite unexpected. Made it all the more interesting. And secondly, the ending- oh, it was killer (I’ll see myself out🤐). Nicely done. The man with hungry eyes was a good use of red herring. Thank yah. I was worried the herring might be a little TOO red, but hopefully not! I’m glad to see a continuation of Detective Hood’s story and I hope to see more in the future. I was wondering when the cocktail would become integral to the story, but then you used it as a major component of your ending plot twist, which was well done. Thanks for sharing! Thank you, I’m pleased you’ve enjoyed this second instalment. Maybe one day we’ll even find out her fate! Oops. Looks like she messed up.